A giant landslide on Iapetus reaches halfway across a 75-mile (120 kilometer) impact crater. Long landslides spotted on Saturn's moon, Iapetus, could help provide clues to similar movements of material on Earth. Scientists studying the icy satellite have determined that flash heating could cause falling ice to travel 10 to 15 times farther than previously expected on Iapetus. Extended landslides can be found on Mars and Earth, but are more likely to be composed of rock than ice. Despite the differences in materials, scientists believe there could be a link between the long-tumbling debris on all three bodies. "We think there's more likely a common mechanism for all of this, and we want to be able to explain all of the observations," lead scientist Kelsi Singer of Washington University told SPACE.com. Composed almost completely of ice, Iapetus already stands out from other moons. While most bodies in the solar system have rocky mantles and metallic cores, with an icy layer on top, scientists think Iapetus is composed almost completely of frozen water. There are bits of rock and carbonaceous material that make half the moon appear darker than the other, but this seems to be only a surface feature. Ice on Iapetus is different from ice found on Earth. Because the moon's temperature can get as low as 300 degrees Fahrenheit (150 degrees Celsius), the moon's ice is very hard and very dry. "It's more like what we experience on Earth as rock, just because it's so cold," Singer said. Slow-moving ice creates a lot of friction, so when the ice falls from high places, scientists expected that it would behave much like rock on Earth does. Instead, they found that it traveled significantly farther than predicted. How far a landslide runs is usually related to how far it falls, Singer explained. Most of the time, debris of any type loses energy before traveling twice the distance it fell from. But on Iapetus, the pieces of ice move 20 to 30 times as far as their falling height. Flash heating could be providing that extra push. Flash heating occurs when material falls so fast that the heat doesn't have time to dissipate. Instead, it stays concentrated in small areas, reducing the friction between the sliding objects and allowing them to travel faster and farther than they would under normal conditions. "They're almost acting more like a fluid," Singer said. On Iapetus, falling material has a good chance of reaching great speeds because there are a number of great heights to fall from. 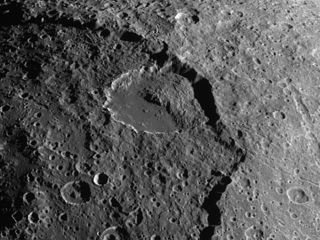 The moon hosts a ring of mountains around its bulging equator that can tower as high as 12 miles (20 km), and the longest run-outs discovered are associated with the ridge and with impact-basin walls. Scientists think that the landslides are relatively recent, and could have been triggered by impacts in the last billion years or so. Resting on the ridges and walls, the material gradually becomes more unstable. Close impacts could set them off, but powerful, distant impacts reverberating through the ice could also send them tumbling. The research was published in the July 29 issue of the journal Nature Geoscience. Differences in gravity, atmosphere and water content make landslides seen on Iapetus difficult to duplicate in the laboratory. But the fact that they happen on different types of worlds makes it more likely that the mechanism triggering the extended slide is dependent on things unique to either environment. "We have them on Iapetus, Earth and Mars," Singer said. "Theoretically, they should be very similar." Singer pointed out the implications for friction within fault lines, which produces earthquakes. As plates on Earth move, the rocks within a fault snag on each other, until forces drag them apart. But sometimes, the faults slip farther than scientists can explain based on their understanding of friction. If flash heating occurs within the faults, it could explain why the two opposing faces slide the way they do, and provoke a better understanding of earthquakes. In such cases, flash heating would cause minerals to melt and reform, producing an unexpected material around the faults. Some such materials have been identified at the base of long landslides on Earth. "If something else is going on, like flash heating, or something making [the material] have a lower coefficient of friction, this would affect any models that use the coefficient of friction," Singer said.